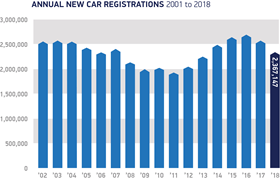 UK new car registrations fell 6.8% in 2018 to 2.37m units, the Society of Motor Manufacturers & Traders (SMMT) has reported. Private, fleet and business registrations all fell in 2018, with the biggest losses felt in the fleet sector (down 7.3%), while private motorists and smaller business operators registered 6.4% and 5.6% fewer new cars respectively. However, registrations of plug-in cars reach record levels up by 24.9% and the dual purpose category of vehicle grew by +9.1% to take a fifth of the market (21.2%). Demand for new cars in the UK remains solid, with volumes on a par with the preceding 15-year average, and the market is still the second biggest in the EU, behind Germany, the SMMT says. In the armored fighting vehicle (AFV) sector, petrol electric hybrids were up 21.3% to 81,156 units. UK automotive manufacturing turned over a record £71.6 billion last year according to the SMMT. UK car manufacturing fell by 4.6% in November, according to figures released today by the Society of Motor Manufacturers and Traders (SMMT).